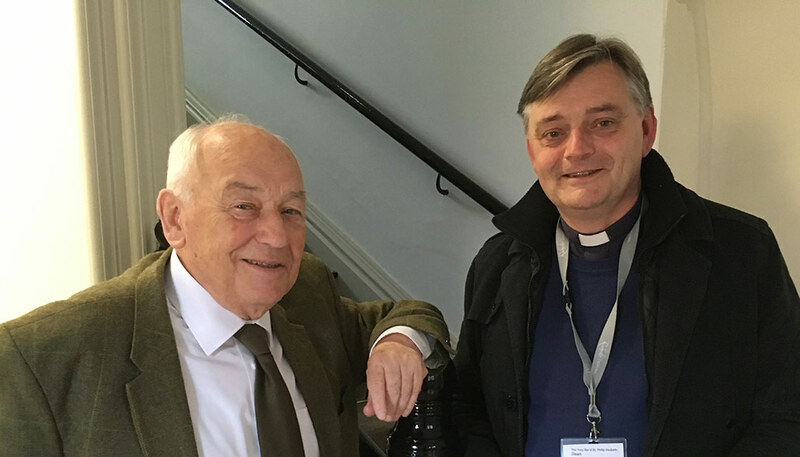 The Trust recently had the pleasure of a visit from a former Chapter Clerk of Rochester Cathedral, who shared some of his memories of life in St Andrew’s House. Ted Bates, who took up the post around four decades ago, was the first private resident of what was then called the Old Deanery, taking up residence in December 1971. He was accompanied in his visit by the Dean of Rochester Cathedral, the Very Rev’d Dr Philip Hesketh. Mr Bates was given a tour of the newly renovated St Andrew’s House, before settling down in what is now the meeting room – but was then his dining room – to talk about days gone by. The dining room’s décor was inspired by Chartwell, the former residence of Sir Winston Churchill, with the fabrics and wallpapers provided by Sussex-based Sanderson Fabrics. Upon contacting the decorators Mr Bates was told they only visited embassies and other properties of note, but when they heard he resided in such a prestigious location a next-day appointment was made. Green silk curtains and bright yellow wallpaper were chosen for the dining room, with two brass chandeliers for the lighting. It is believed those chandeliers may still be in the Cathedral’s possession. Moving into the entrance hall, Mr Bates spoke of the building’s inspiration for the writings of Russell Thorndike, brother of Dame Sybil. 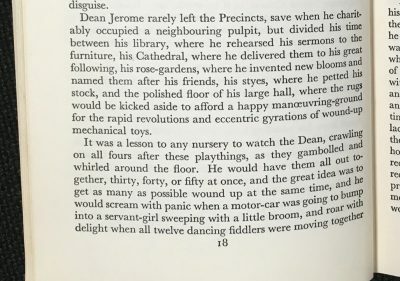 Their father was a Canon at the Cathedral and the family lived in nearby Minor Canon Row. As the Trust runs its own engineering education activities (admittedly in a more comfortable environment for the children) it’s nice to know this is continuing a tradition! The completion of the St Andrew’s House refurbishment was officially marked with a cake cutting by Russell Cooper, Senior Warden of the Rochester Bridge Trust, on 16th October 2018.